Friend Chandramouli 'Suggested' that I read the Kannada edition 'Vachana Bharata' by A R Krishna Shastry M.A. I know Kannada and can understand, but I am no scholar! I am thankful to him as a perspective from an Indian language is invaluable. Written about 50 years ago, it is recent, but India has changed a lot since then. The well made book is priced at Rs.7 and 50 paise only and the author was apologetic that he could could not sell it for less due to high costs. The first thing that my caught my eye was 'The place where Parashurama killed the Khsatriyas was the same place where Kauravas and Pandavas fought and 18 akshohinis of warriors died in 18 days of war'. 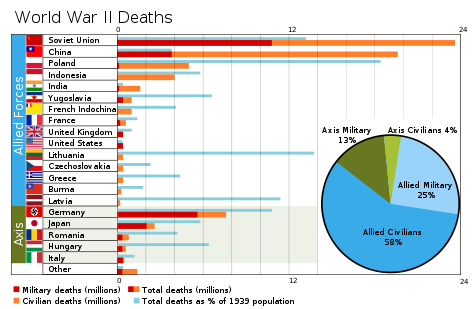 Curious, I found that the estimated casualty for the second world war in 5 years of war including civilian deaths is 70,000,000. (Wikipedia). This prorated to 18 days of war will be 690,411. Difficult to comprehend that people killed in the 18 days of Mahabharata war were almost three times that of second world war and the proportion would be higher if civilian deaths are not considered! Civilians did not die in the Mahabharata war. This world map puts the areas of conflicts in perspective. Kurukhestra would be just a dot in the map. 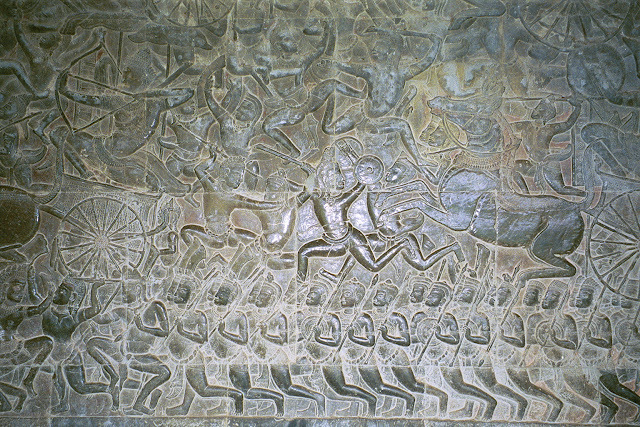 This brilliant panel from Angkor Wat in Cambodia tell us how close and fierce was the battle! The noise, the blood, the pain and anguish of the injured and the dying is palpable! You have to just close your eyes and imagine a battle field thousands of times larger. Times of India: 2 nov 2011. Army likely to recruit one lakh soldiers for China border.